Although garage doors are quite useful and convenient, they can be dangerous, especially since they rely on mechanical and electrical parts to open or close and these parts suffer from wear and tear over time. This means that a door weighing up to 500 pounds can come crashing down at any moment and crush anyone standing beneath it. It is wise to heed safety advice provided by the manufacturers of such doors. It is not advisable to let young children play with the garage door opener. For example, a child who does not understand how the gadget works may press the close button and crush other children playing under the door. Therefore, if you have young children at home, warn them not to play with the device. After installing a garage gate, do not assume that it will always work without any problems. Just like your car, the gate requires regular safety checks. The rule of thumb is to have a safety check carried out every month by a qualified technician. Manufacturers have taken steps to ensure that garage doors are as safe as possible. To start with, most modern doors have anti-entrapment features to halt or reverse direction in case of resistance under the doors’ path. For example, some manufacturers have incorporated cameras to detect the presence of people walking or playing under the door. If your garage door is old and does not have any safety features, consider installing a new one. Avoid pulling the emergency release cord when someone or your pet is standing close to the door. 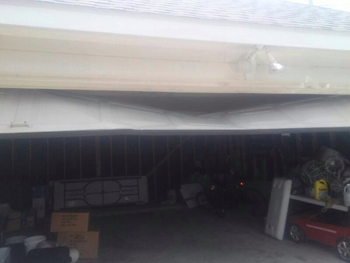 The force and weight of the garage door can cause serious injuries. It is advisable to pull the emergency release cord only when the door is down. If you plant to work under your garage door, make sure you have support - such as a ladder - in place. In case of mechanical failure, the door will rest on the support and not your body.